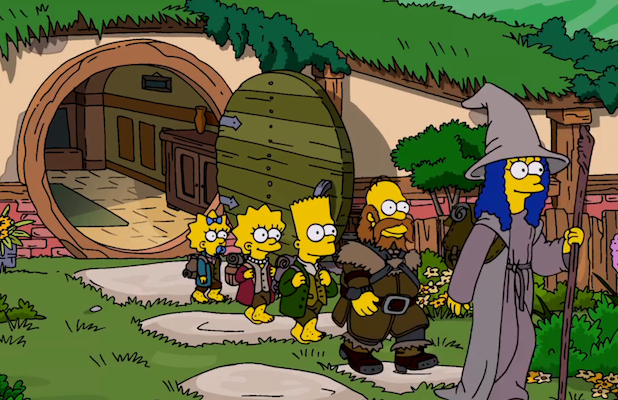 Homer and his family travel to Middle-Earth in search of the Comfy Couch in this Hobbit spoof, the latest couch from the episode Four Regrettings and a Funeral. Four Springfielders are prompted to try to right past regrets following the funeral of a beloved neighbor. Homer regrets selling his Apple stock to buy a bowling ball, Marge worries she caused Bart’s rebellious streak, Mr. Burns reminisces about a romance he gave up with a beautiful Parisian woman. Kent Brockman admits he was too afraid to leave local news and follow his former partner, Rachel Maddow (guest voicing as herself), to cable news in the all-new The Simpson’s Four Regrettings and a Funeral episode airing Sunday, November 3, at 8 PM ET/PT on FOX.